“If he’s so smart, and so sane, why has he fallen short of his spectacular potential so far?” No need to wonder who Frank Rich is writing about in this sentence, which gives the headline to this recent New York Review of Books essay: “Why Has He Fallen Short?” Only President Obama could inspire that particular blend of admiration and disillusionment among liberals. In a sense, the current liberal disappointment in Obama is an enormous compliment: if averting a depression and passing the biggest domestic reform legislation in two generations is not living up to his potential, that potential must be truly enormous. But, beneath all the individual criticisms of Obama’s policies—on Afghanistan, Guantánamo, BP—it’s possible to hear a larger disillusionment, one that has to do less with this president than with a perennial liberal dream. This is the dream that the skeptical and empathetic intelligence cultivated by literature—Lionel Trilling’s “liberal imagination” —can be used to govern men and nations. 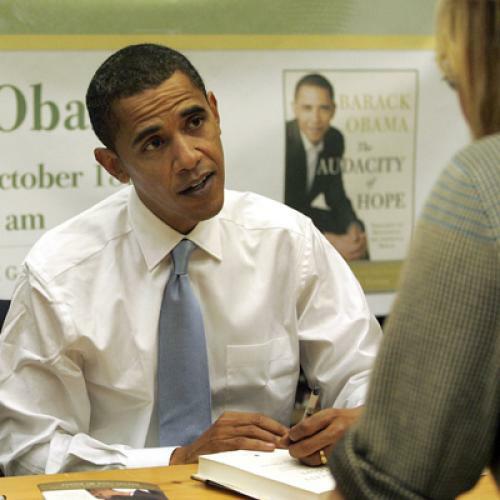 Dreams of My Father, Obama’s memoir, may not be a great book, but it demonstrated enough of this kind of irony and empathy to raise high hopes in many readers. But is the plurality of the self really a moral that can be applied in the political realm?Grand Strategies: Literature, Statecraft, and World Order, a new book by the career diplomat Charles Hill, puts this question in sharp focus. Hill offers a kind of survey course on the Great Books, mining them for insights into politics and diplomacy. Grand Strategiesopens with a discussion of Odysseus’s embassy to Achilles, in The Iliad, and goes on to cover everything from Robinson Crusoe (the title character of which considered as the founder of a one-person state) to T.S. Eliot’s “The Waste Land” (which inspires the perhaps over-literal observation that “today’s diplomatic representation is fragmented and evanescent. Nearly every agency of government sends its representatives abroad”). Yet reading the book actually had the reverse effect, at least on me: It offers a few good reasons for believing that literature is a very dubious basis for political leadership. First is the fact that, as the great radical William Hazlitt acknowledged to his own chagrin, “the language of poetry naturally falls in with the language of power." It is only in the very recent past that it has been taken for granted that poets must be pacifists. To read The Iliador The Aeneid or Henry V is to see imperialism and conquest glorified: These books convince us to admire what our reason would condemn. A second, related point is that literature needs heroes, and so it tends to cover the realities of leadership under a veil of heroic mystification. As Hill writes in his discussion of Schiller’s historical drama Wallenstein, “Schiller locates a quality common to many great commanders and statesmen. ... In the end their achievements may be inexplicable." This is not a principle calculated to encourage democratic self-government. There is even a kind of mystification in the way that Hill talks about “statecraft,” which often seems to be just another name for charisma and luck. Marvell’s “Horatian Ode" on Cromwell, Hill writes, “aims to instruct the statecraft of the ages.” But how can a leader be instructed by a sentiment like, “Much to the man is due/To ruin the great work of Time"? Ruination is impressive, but so is restoration; Marvell is sympathetic to Charles I as well as Cromwell and, indeed, would serve both in his lifetime. This leads to the third point demonstrated in Grand Strategies: Because literature is always interpretable, the same text can be used to support many different political beliefs and courses of action. During the Nixon administration, Hill writes, Kissinger brought a cult of Thucydides to the State Department, and “soon National Security Council staffers and Foreign Service officers who had never read the work were quoting the Athenians in ‘The Melian Dialogue’: ‘The strong exact what they can; the weak concede what they must,’ the motto of Cold War realists.” Yet a cold war hawk could just as well have replied that this maxim of realpolitik is meant to appear despicable, a sign that Athens has lost its virtue and is headed for the arrogant catastrophe of the Sicilian expedition. As Hill writes, “[A] classic text can be defined as one that each generation reads in its own way to fill its particular need.” How, then, is it possible to tell if you are listening to the wisdom of literature, or if you are using it for post facto legitimization of what you believed already? It is partly in response to these fears about the exploitation of literature by power, and vice versa, that post-World War I writers have insisted on identifying with the victims of power. As Hill points out, this can lead to its own absurdities—he describes Secretary of State George Shultz addressing a meeting of PEN in the 1980s and infuriating the left-wing audience by telling them, “Don’t be so surprised that Ronald Reagan and I are on your side.” Of course, in geopolitical terms, he was right: The American victory in the cold war was a victory for free expression. But the advent of Barack Obama, who many writers believed was “on their side” in a more partisan liberal sense, has taught another important lesson: that no statesman can finally be on the same side as the writer, because the virtues of the man of action are different from the virtues of the writer, or the reader. Obama’s record in office only confirms what we were happy to forget in the thick of the 2008 campaign: No matter how high a value we place on irony, it is impossible to govern ironically.